Mureed Baloch, spokesperson of the outlawed separatist United Baloch Army (UBA) said Pakistani newspapers were an extension of the “Anti Baloch” policies of the state of Pakistan and gave an ultimatum that unless this changed by October 24, they will take severe action. He warned journalists to stay away from newspaper offices and press clubs and for newspaper distributors, news agents and sellers to cease their activities, failing which they would be shot. 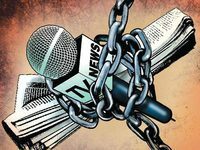 The recent escalation of threats by Baloch nationalists has caused alarm and fear among journalists In Balochistan. Khalil Ahmad, President of Balochistan Union of Journalists (BUJ) urged the government to provide protection to journalists and deal with this hostile situation so that they can do work in safety. The All Pakistan Newspaper Society (APNS) expressed grave concern on these threats and ultimatum to media houses and media workers operating in Balochistan and termed these threats as harassment and attack on press freedom in the country. Sarmad Ali, President and Umer Mujib Shami, Secretary General of the All Pakistan Newspapers Society said the print media in the province was objectively giving coverage to the events in the province within the limits of the law, hence, any threats and dictation to the media was uncalled for and counterproductive. The APNS strongly urged the Balochistan government and law enforcing agencies in the province to provide full security to the media houses, journalists and the distribution network of newspapers in Balochistan. The APNS hoped that the Chief Minister, Balochistan and the Core Commander would take immediate action on the threats being received by the media houses in the province.